The Oregon Coast is one of Travel Oregon's 7 Wonders, and thousands visit the coast every day. How many times have you jumped in the car and beelined it to the beach? You're most likely speeding by some great adventures you never knew existed. From hidden waterfalls to mountain bike trails, there are plenty of interesting places to stop and stretch your legs or camp for the night. So, what is there between you and the Oregon Coast? Upper Salmonberry River Trail: Flat trail following the old timber tracks. Wilson River + Tillamook Forestry Center: Beautiful forestry center complete with a fire lookout, day use area, and campground. Bridge Creek Falls: Just a short stroll to stretch your legs. Munson Creek Falls State Natural Area: Tallest waterfall and second-tallest Sitka spruce on the Oregon Coast. Drift Creek Falls: Well-maintained trail to a beautiful suspension bridge overlooking the falls. Niagara Falls + Pheasant Creek Falls: Drive and hike through the old-growth forest to find two waterfalls. Marys Peak: Take either the East Ridge or North Ridge trail for great wildflowers and valley views. Harris Ranch Trail: Camping, fishing and hiking in the Drift Creek Wilderness. Alsea Falls Recreation Area: Mountain bike on the Alsea Flow Trails or explore the waterfalls at the recreation area. Relaxing creekside. Photo by Jackie Arnal. Kentucky Falls: 4.5-mile loop to three beautiful waterfalls. Carpenter Bypass Trail System: Fun singletrack mountain bike trails close to Eugene. Sweet Creek: More old-growth forest filled with wildflowers and waterfalls. Siltcoos Lake Trail: Intermediate singletrack trail on a lake near the coast. Camping is available. Golden + Silver Falls: Beautiful viewpoints and waterfalls in the state natural area. Adventures on the Rogue Wild and Scenic River: The Rogue should not be missed whether you kayak, raft, fish or just hike along the Rogue River Gorge. It's a beautiful river with plenty to offer any adventurer. Illinois River: Class V whitewater rafting, camping, fishing and of course, more waterfalls. 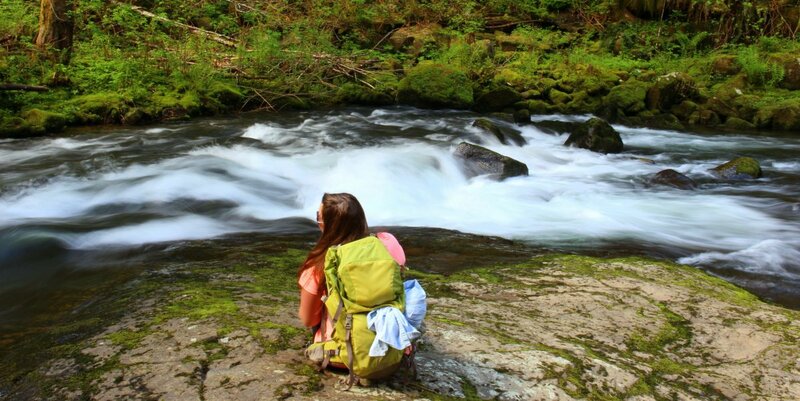 Chetco River Hike: An 18-mile backpacking trail through isolated wilderness to crystal clear rivers and waterfalls.